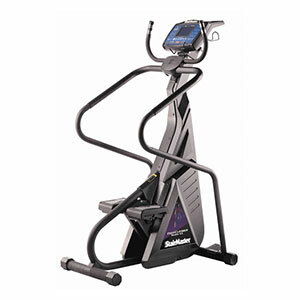 The Stairmaster 4600 reading rack accommodates larger reading material with a built-in cassette and water bottle holder mounted to the unit’s consol, which also features a pivoting head that reduces glare and accommodates users of all heights. One-piece soft pedals offer the ultimate in stepping comfort Patented, independent pedal geometry with four-bar linkage ensures safe, biomechanically correct movement Ergonomically designed side handrails accommodate a wide range of users. The FreeClimber 4600 models are backed by 17 years of proven performance and name recognition Speeds range from 26 to 174 steps per minute.